So, last night was Book Group and my turn to host. Ever since my Facebook pal Chase recommended “The Orphan Master’s Son” and I read it, I had wanted to talk about it with other people. I thought I’d have to wait until August, but then Gail went AWOL (she does tax prep and is probably buried until after April) and a slot opened up. I grabbed it because it was a great opportunity on two fronts. The first was no longer having to wait months and months to talk about the book. The second was getting Sweetheart to join Team Clean the Landfill We Call Home. I adore Sweetheart and never want him to be upset. He works hard every day at a job that’s physically and mentally demanding. I haven’t yet figured out how to get him to see cleaning as a reward in itself and to take joy in the doing of the thing. I also haven’t been able to convince him of the extra joy in doing it together. But somehow, the prospect of having people over seems to work as a trigger for getting things done. So, by the time Sally, Regina, Betsy, Karen, Ann, Krys, Tria & Pam showed up last night, the downstairs looked better than it has in ages. I spent the day in the kitchen, deep-cleaning the floor, the dog feeding/watering area, the corner where the recycling had piled up (sub-zero temperatures are not conducive to taking that stuff out), and a place near the basement stairs where store-able things had collected. Then, I gave myself a big reward. I got out the brand-spanking new gluten-free cookbook from America’s Test Kitchen that Sara had told me about. I followed the directions to mix up a batch of all-purpose flour, and then I made a lemon pound cake. 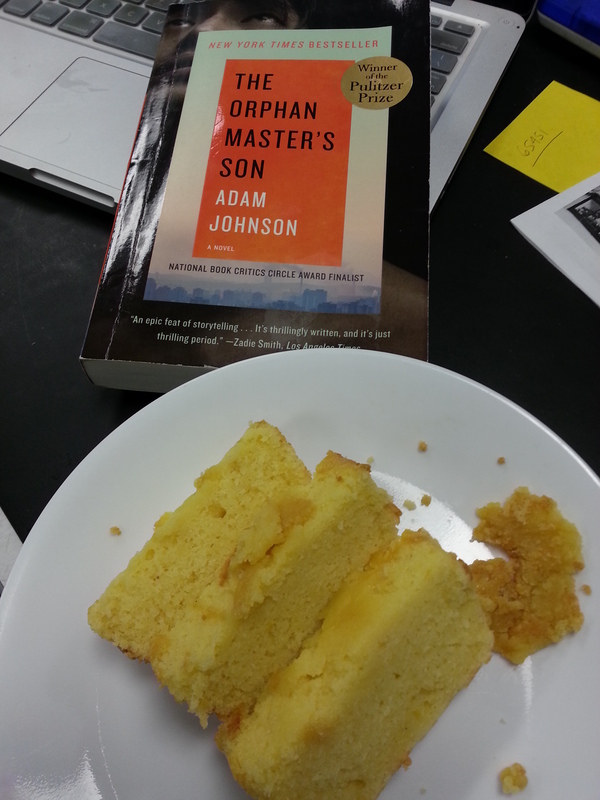 The lemon cake baked in the small loaf pan, and my copy of “The Orphan Master’s Son. I loaned it to Ann, and Krys brought it back. Book group books frequently visit multiple households before Book Group Night. Canned peaches also play a prominent role in the book, as does ice cream. So I served cake with peaches and ice cream after the discussion. During the discussion, I served cheese and crackers. And it’s not Book Group unless we demolish at least a couple of bottles of wine. Some of us drink white and some of us drink red. Some of us (not me) stick to water. Before we get into the book, there’s always talk about what’s going on in various lives. Regina was just back from Chile, and Karen had had surgery. So we talked about that, and about spring finally coming, and discussed some of what Regina had told us in detail about her travels via our book group’s listserv. We were particularly interested in hearing more about the different levels of coffee shops, where scantily-clad women (depending on the level of coffee shop you are visiting) either simply serve you coffee, or serve you coffee dressed in even scantier attire, or are willing to expose various body parts. After our “other things” yack, we got into talking about the book. Everyone agreed it was a tough read, but worthwhile. Karen made it through 50 pages before stopping, because she said it wasn’t a recovery book. No disagreement there. Betsy said it was a little too violent for her, so she stopped. But that’s fine – we’re like that. You don’t have to read the book to come to book group. You just have to be ready to either talk about it or listen to other people talk about it. Sally read it in three days. Krys and Regina both said their Sweethearts expressed versions of “You’re not really enjoying this book, are you?” watching the way they’d read for an hour and then walk away. That was kind of the way I had to read it, too. We talked about various aspects – the brutality of life in North Korea, the role of the individual, whether the main character had a sense of right and wrong and how, if at all, it affected his decisions. We also discussed the disconnect between and possible reasons for the unremitting descriptions of harsh reality in the beginning and the near-magical-realism toward the end. Sally brought along her copy of the March issue of Vanity Fair, which has a big feature on Kim Jung Un. I raised my hand first, so it stayed at my house. When I’m done reading it, I’ll pass it on to Ann. This is beautiful writing. Reading your “blog” feels like being with you. Love to you. Thank you, Cindy. We’ll have to get together soon.